As the discourse of human rights becomes ever more widespread, the analysis of contemporary human rights practice must contend with its pluralistic and contradictory features. In this Article, we introduce the metaphor of rights as "footprints." We suggest that this metaphor captures the expressive and constitutive role of rights, and provides a critical tool with which to understand the accomplishments of the human rights field. In doing so, we document a right-to-health campaign in Accra, Ghana, which sought to end the human rights infringements that arose from the financing of health care through user fees. These infringements occurred when public hospitals forcibly detained patients, after their discharge, until they had paid their medical expenses. This occurrence, spectacular in its assault on liberty, is increasingly and banally practiced in the cash-strapped hospitals of developing countries, in and elsewhere. Our Article focuses on the role of story-telling and collective memory that galvanized further rights-protecting political action, during the initial moment of community-mobilization and in the intervening seven years. Importantly, we record this effect in both a local community in and in an international community of human rights practitioners. Our metaphor of footprints challenges the alternate understanding of rights as constituting formal legal precedent, international covenants, community anecdotes or institutional blueprints. It describes the ways in which collective memories of political mobilization, repeated and retold through shared yet shifting frames, generate multiple pathways towards a "realization" of human rights. 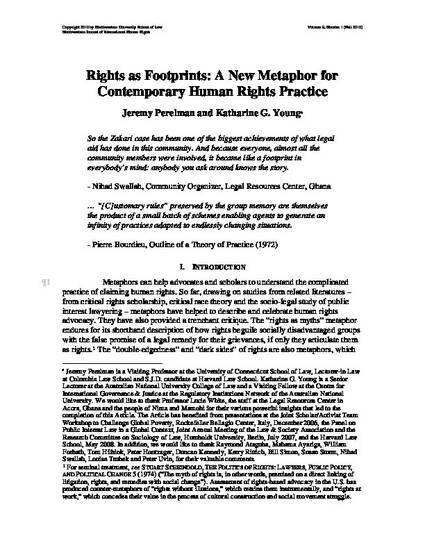 We suggest that the forward-looking progression of human rights advocacy can be intimately related to the experience of looking back, and that the metaphor of footprints can reinforce the role of collective memory in a dynamic, community-focused and community-reinforced transnational human rights practice.